The Walt Disney World Co. has applied to the Federal Aviation Administration for an exemption to fly drones at Walt Disney World. The Walt Disney Company has filed for an exception to Federal Aviation Administration rules in order to use drones for entertainment purposes at Walt Disney World and Disneyland in California. The 48-page application was filed two months ago. Flying drones for commercial use is currently illegal except if an exemption is given by the FAA. Disney wants to use up to 50 drones at a time. The petition also cites Disney’s legacy of technological innovations and its “unparalleled safety record.” The Flixels would fly pre-programmed flights in areas at least 100 feet away from guest-viewing areas. The drones would launch from land within restricted areas and their flight paths would only take place over water and restricted areas, the document says. Each drone’s airspace would be no more than 600 feet in diameter. Flight time for each aerial performance would be up to 10 minutes and drones would only take off if weather conditions are favourable with constant wind speeds of no more than 10 mph and gusts are less than 15 mph. The Flixels would weigh less that 10 pounds. 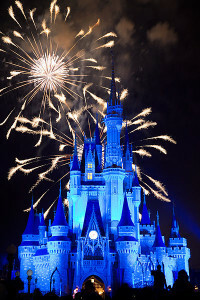 The application also includes Disneyland Resort in Anaheim, California.